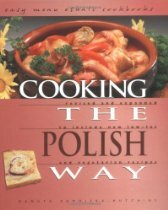 Polish recipe for herring with onions and chopped eggs. And while you are setting the herring up to soak, boil the eggs so that they have enough time to cool before you chop them. Finely chop the onions. Because you will use some of the red onion as a garnish, do be sure to chop the white and red onions separately. If you can find a sweet white onion, use it. But if you can't, just use what you have on hand. After the herring has soaked long enough, rinse it, cut it into small pieces and lay it in a shallow dish. Lay red and white onions over the slices. Chop the eggs and lay them over the onions. Mix some yogurt and mayonnaise. Just enough to have enough to pour over everything in the dish. Now garnish it with some chopped red onion and parmesan cheese. You can also garnish with chopped chives, pimento, or pickle. Use your imagination.